Wahama junior Trevor Hunt (5) setps in to make a tackle during Friday night’s TVC Hocking football contest against Eastern at Bachtel Stadium in Mason, W.Va. Ultimately, the week started better for the White Falcons than it ended. 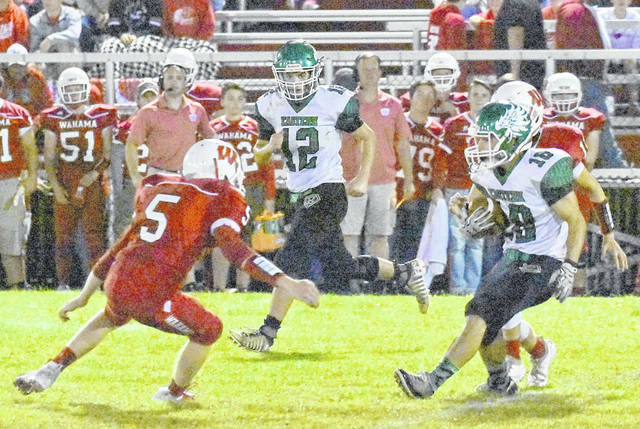 After picking up its first victory of the 2018 campaign on Monday, the Wahama football team didn’t have much left in the tank four days later as visiting Eastern posted a 42-0 victory over the White Falcons during a Week 6 Tri-Valley Conference Hocking Division contest at Bachtel Stadium in Mason County. The Eagles built a 28-0 halftime advantage and never looked back as the Green and White tacked on two more scores in the third canto for a 42-0 lead — which led to a running fourth quarter clock. The White Falcons have lost three straight home games to the Eagles, who also posted their first shutout of Wahama since a 22-0 victory back in 1999 at EHS. The White Falcons still lead the all-time series by a sizable 33-10-0 overall margin. Neither Hannan nor Point Pleasant were in competition in Week 6 due to bye weeks. The White Falcons return to action Friday when they travel to Waterford for a TVC Hocking contest at 7:30 p.m. Both Point Pleasant and Hannan are again off next week. Both programs return to action in Week 8 as the Big Blacks travel to Meigs for a 7 p.m. Friday night contest, while the Wildcats travel to Montcalm for a 7:30 kickoff on Oct. 12. Due to an early deadline, the Eastern at Wahama football game from Week 6 will be available in the Tuesday sports edition of the Point Pleasant Register. The game story will be available online at mydailyregister.com before appearing in print.